Looking for Teeth Whitening in Stratford Upon Avon? Teeth can become discoloured by food, drink, smoking and certain medications. Some people have naturally slightly darker teeth than they would prefer. Teeth whitening can permanently and gently lighten the colour of your teeth using a safe dental bleaching gel. We offer 2 types of teeth whitening: Home bleaching or in-surgery power bleaching. This whitening involves placing a little dental bleach in specially made dental bleaching trays. You then wear the trays for a few hours during the day or overnight. Results are usually visualised after a few days and people often achieve the whiteness they desire within two weeks. Your dentist will advise you to try and avoid certain foods and drinks which can stain your teeth whilst you whiten them. On the other hand whitening can also be achieved via power bleaching where your teeth are whitened in the dental chair using a light to activate the bleaching gel. 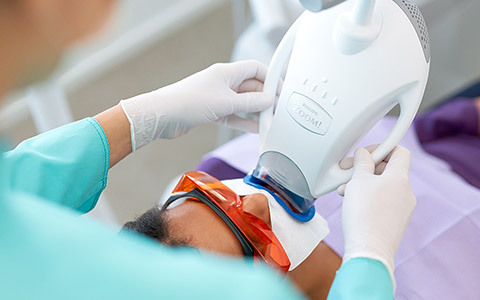 At Evesham Place Dental Practice we use Philips Zoom. The Zoom treatment we use is considered as the leading power teeth whitening brand in the world. After 1 hour you can expect your teeth to look a few shades brighter. We recommend you carry out a short spell of 30 minutes per day for 3 days of home teeth whitening following on from Zoom. This will ensure your teeth achieve the best possible shade and stay bright. Customised bleaching trays and bleaching gel are both included in the cost of Zoom with us. Some patients may experience a transient sensitivity. At your teeth whitening consultation, your dentist will assess whether this is likely to affect you or not. If your dentist feels you are at risk of experiencing sensitivity, they will provide you with a desensitising toothpaste. They may also advise a bespoke, gentle teeth whitening regime. Sensitivity can be experienced but is temporary and will cease shortly after teeth whitening is stopped. At Evesham Place Dental Practice we will provide you with an initial consultation where we will assess your suitability and discuss your desires. Afterwards we will provide a checkup to establish how your whitening treatment is going. Some patients prefer to discreetly lift the colour of their teeth a little where as some like to go ‘Hollywood white’! Included in the cost of your teeth whitening, we also provide a follow up appointment; We examine your teeth and check you are happy with the results. If you would like to book a teeth whitening consultation or have some advice over the phone, please call reception today. Yes. Your teeth will be permanently whiter than they were. Some people find they darken again a little over time but this is usually caused by surface staining. From here on our hygienist can help remove this stain for you. Of course you may wish to occasionally ‘top up’ your teeth whitening with a night here or there. Should I go for home whitening or in-surgery power whitening? The end result is basically the same but power whitening gets you there faster! All things considered Power teeth whitening is ideal if you’re in rush and have a special occasion approaching. In conclusion ‘Power Whitening’ is often accomplished in one session. Can I buy teeth whitening for a friend or family member as a present? Yes we have gift vouchers available to buy at reception (subject to recipient suitability).